Benin Punitive Expedition commemoration website. 2017 marks 120 years since that momentous event. Human Cost: Unknown [due to the cost of treating injured and maimed personnel from the war, many were ill for years to come and some for the rest of their lives]. > British side: Black troops did most of the fighting and were at the front of the advances. As they fell they were simply stepped over and left where they fell. No reliable record was kept by the British on how many of them were killed in action (Roth, 1903). > Benin casualties were hurriedly dumped in mass graves across Benin City as the people fled (Bacon,1897; Moor, 1897; Rawson, G, 1914; Roth, 1903). 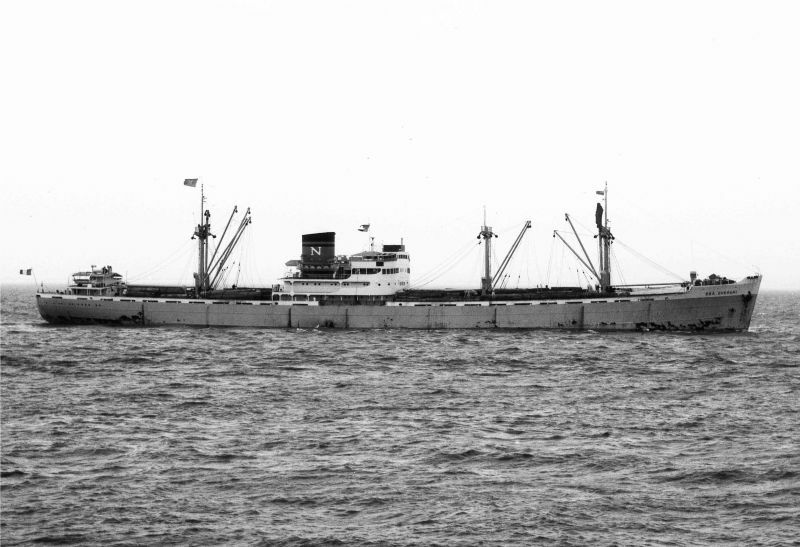 Cargo Ship MAASHAVEN renamed Oba Overami in 1967. 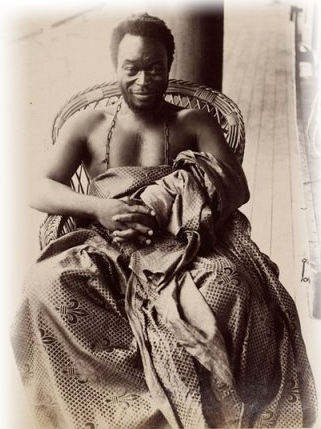 Oba Ovonramwen Nogbaisi was the 35th King of Benin Kingdom and ruled from 1888 to 1897. Oba Ovonramwen successfully held out against colonial rule. He evacuated Benin City and neighbouring countryside villages and towns to minimise civilian casualties in the pending British invasion (Benin Punitive Expedition of February 1897). 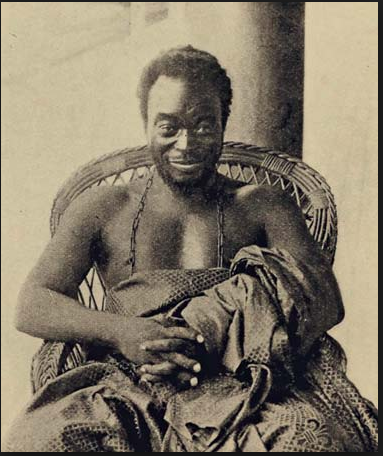 As recorded by Roth (1897), when Oba Ovomramwen gave himself up on August 7 1897, ‘The king was simply covered with masses of strings of coral, interspersed with larger pieces, supposed to be worth many pounds. His head dress, which was in the shape of a Leghorn straw hat, was composed wholly of coral of excellent quality, meshed closely together. His wrists up to his elbows were closely covered with coral bangles, so were his ankles. He only wore the usual white cloth of a chief, and underneath, a pair of embroidered and brocaded trousers; he had nothing in the way of a coat, but his breast was completely hidden from view by the coral beads encircling his neck.’ (Roth, 1903, appendix 1 p.xiii). ​Oba Ovonramwen was simply covered in thousands of red coral beads each worth near a thousand pounds. This was Benin opulence on display. His kingdom, his palace, his houses and his personal effects were plundered as a result of ​'a new king' in town. 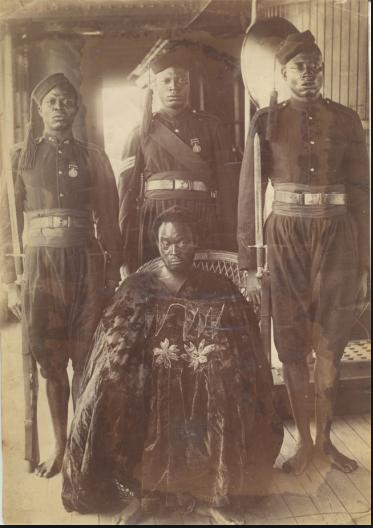 Oba Ovonramwen died in exile in Calabar in 1914. 3) Phillips, J.R. , 17 Nov 1896. Dispatches to Foreign Office from Consul-General, Catalogue of the Correspondence and Papers of the Niger Coast Protectorate, 268 3/3/3, p. 240. National Archives of Nigeria Enugu. 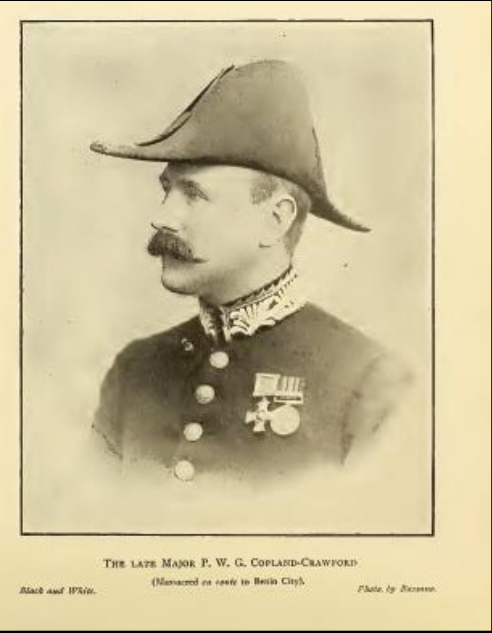 Admiral Sir Harry Rawson led the Benin Expedition invasion force of 1,200 British squadron comprising Royal marines, sailors and over 5,000 Niger Coast Protectorate Forces. ​In addition it is estimated that some 5,000 natives served in one form or the other including as carriers, guides, mappers, cooks, etc. It was during the march back from Benin on 22 February 1897 that Rawson developed hip arthritis which caused him excruciating and agonising torture that he had to live with for the rest of his life (Rawson G. page 156). "For his services on this occasion Rawson received the K.C.B. and the thanks of the Foreign Office, but his pleasure at receiving these new-found honours was more than counterbalanced by the permanent injury to his health resulting from the expedition. His determination to share the privations of his men cost him dear. For weeks afterwards he was prostrated, and he bore the marks of the Benin campaign to his grave." (Rawson G., 1914, page 159). Harry Rawson died 3 November 1910. 6) Roth H.L. Great Benin, 1903, appendix 11. 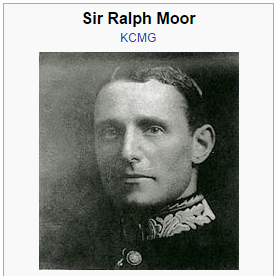 Sir Ralph Moor, was left behind to look after British interests in the territory after the expedition. Shortly after British troops plundered Benin City, Consul-General Moor, pursued Oba Overami into the forests. He reported back to the Foreign Office in London that he'd tracked through seven towns and villages to the north and he'd burnt a deserted town which had been built to the same plan as Benin City. (Ratte M. L 1972, p.64). A number of chiefs were also shot dead for not betraying Oba Overami's whereabouts. Oba Overami surrendered on August 3 1897. Moor trialled him in a kangaroo court on September 5 and sent him into exile in chains on September 13 1897. In 1909, Ralph Moor committed suicide by poison deliberately taken whilst temporarily insane after suffering acutely from insomnia. He'd taken weedkiller that he'd bought for his garden. The inquest heard that for four years after he returned from Africa, he suffered with Malarial and Blackwater fever that induced insomnia. 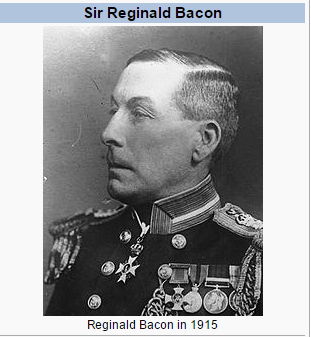 Sir Reginald Bacon wrote a very detailed account of the expedition in his book Benin City of Blood. 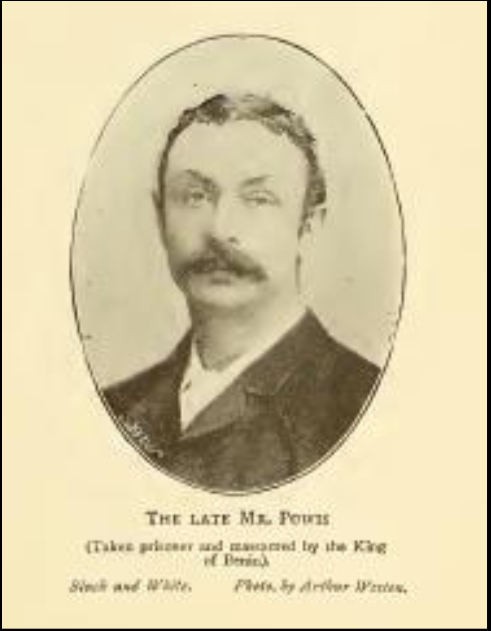 Acting Consul-General Phillips would not take no for an answer not to visit the king. He led an invading force of nine British officials and over 260 African soldiers and carriers. They were annihilated by Benin Strike Force on January 4 1897. 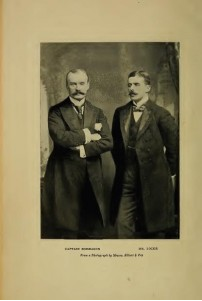 Two British officials however lived to tell the tale of what happened to them. They survived by hiding in the forest for five days. 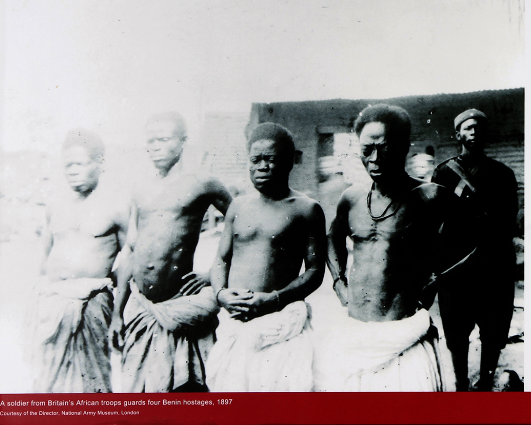 The British government reacted by sending in the punitive force which came to be known as Benin Punitive Expedition. The two men who survived the annihilation by the Benin Strike Force - Mr Alan Boisragon and Mr Locke. They hid in the forest with no food and gunshot wounds for five days. They survived by drinking dew drops from rain-forest leaves. Mr Alan Boisragon later wrote a book - The Benin Massacre. 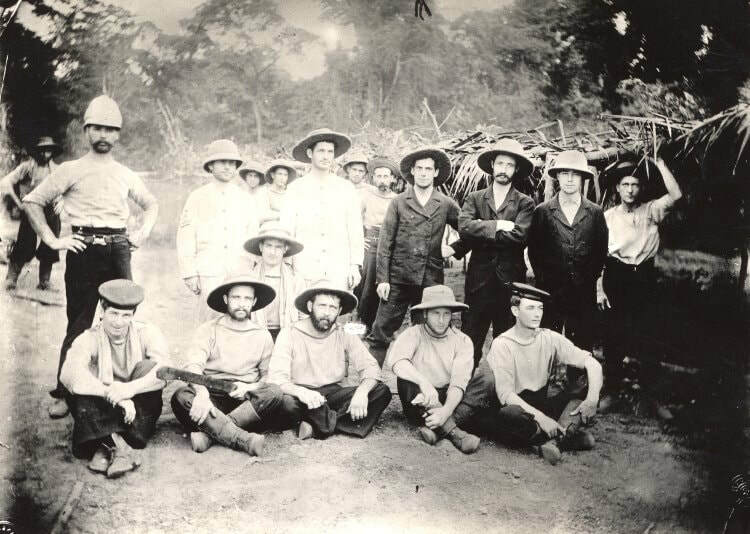 ​Vice Consul Kenneth Campbell the Assistant District Commissioner for Sapele was meticulous in making excellent arrangements for the planned expedition - invasion of 4 January 1897 - to Benin (Boisragon, 1897, pages 59 - 60). He oversaw the black troops and carriers. In this photograph, he can be seen with the Kroomen. They were part of the Royal Protectorate Force based in Sierra Leone. They were often called upon and brought over to help in British military actions against natives across the protectorates. He was well regarded by all for his hard work. Unfortunately, he did not pay heed to the warnings from everyone to turn back. He followed Phillips without permission from London. 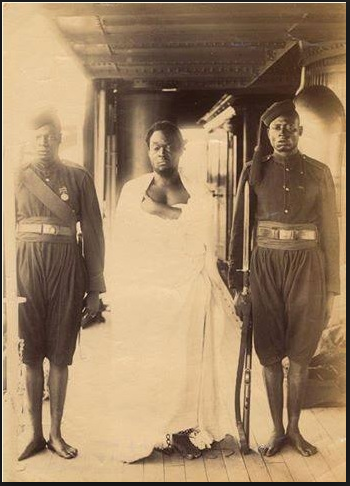 ​Oba Ovonramwen aboard the Yacht Ivy on his way to exile in Calabar on September 15th 1897. General Ologberese commanded and led the Strike Force that annihilated the invading British force on January 4th 1987. Additionally, in support of king and country he held out and fought the British for a further two years from the jungle. He was eventually betrayed, snared and turned in by people who were frustrated with British tactics of destroying their houses and food crops. The British were effectively starving to death people whose homes they had burnt down in towns and villages suspected of harbouring him or any of the other freedom fighter chiefs. He was trialled on June 27 and executed on June 28. 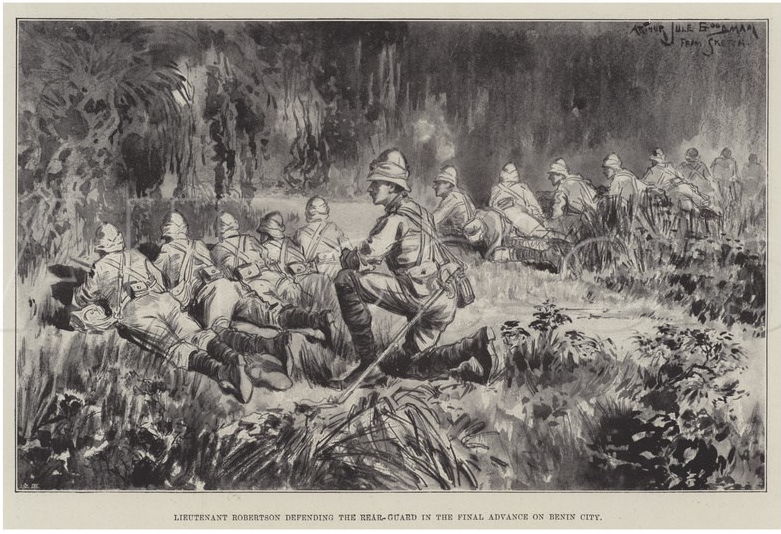 ​Three of the British officers massacred on their way to Benin on 4 January 1897 . Some naval rankings of the 1,200 British troops deployed to the punitive expedition. 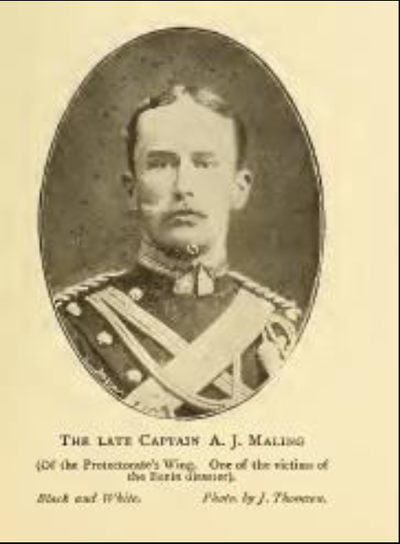 By 28 February 1897 when the men had re-embarked their ships, over four hundred of them across five war ships were inflicted with malarial fever. These lasted many weeks and months with some of them developing complications from their illness (Rawson H. 1897; Rawson G. 1914). Goldie believed that removing the Benin River middlemen mainly the Itsekiris and the Ijaws and dealing directly with the main producers of export commodities (palm oil, nuts and rubber) would be beneficial to the Royal Niger Company. Both the Niger Coast Protectorate and The Royal Niger Company perceived the Oba of Benin as their main obstacle to this end and resolved to use whatever means necessary to persuade him to open up the routes for this to happen. In October 1896 Consul General Phillips sent a letter to Oba Overami to, 'Let the Whiteman come up to your country whenever he wants,' (Boisragon, 1897, p58). The NCP also wanted to colonise Benin Kingdom in order to bring it under the control of the Southern Protectorate of the Niger River to make this a single unit for administration. Four Benin chiefs accused along with 3 other chiefs of killing the seven white-men in the Phillips invasion force of 4 January 1897. Chief Obahawaie, Chief Obaiuwana, Chief Ugiagbe and Chief Usu, the four chiefs accused along with General Ologbosere of being responsible for killing Phillips and the other white men in the invading British Force of January 4th 1897. 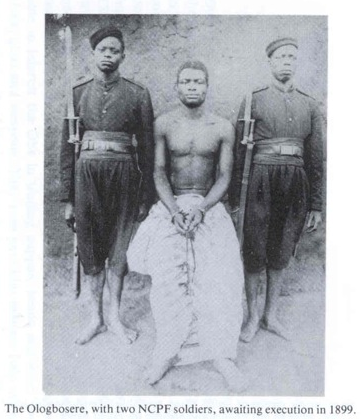 Their trial took place in the Consular Court House in Benin City on Wednesday 1st September 1897 beginning at 4 p.m. It was a kangaroo court with no advocate on either side. Chief Obaiuwana committed suicide the night before the trial began. Chief Ugiagbe also committed suicide. Chief Obahawaie and Chief Usu were found guilty on 3rd September and shot the following morning 4th September 1897. The search for General Ologbosere continued for the next two years despite Consul General Moor instructing any villages suspected of assisting him to be burnt down (Moor dispatch to Salisbury, Foreign Office in London, March 12, 1897). His Majesty still managed a smile.